Established in 2016. 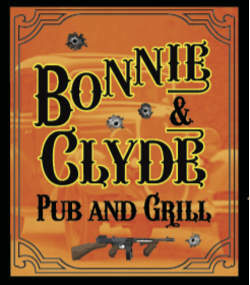 Bonnie & Clyde Pub and Grill boasts an intimate 1930’s atmosphere. Offering 36 drafts, over 70 craft bottles, specialty cocktails, and a wide variety of local and imported wine. Enjoy a full menu with plenty to choose from. Bonnie & Clyde strives to offer outstanding service in a comfortable, casual atmosphere. Visit Bonnie & Clyde Pub and Grill during Pocono Mountains Restaurant Month, "Taste of the Poconos" - April 22, 2019 to May 19, 2019!